In author Mark Goldblatt’s debut MG novel Twerp, 11-year-old Julian Twerski is, well, a twerp. And it’s not just a play on words involving his last name, either; it’s because he’s always allowing himself to be talked into doing something that gets him into trouble. When the book opens, Julian is just coming off of a week-long suspension for being involved in a neighborhood prank on a hard-of-hearing boy that has disastrous—and bloody—results. A teacher who recognizes Julian’s creative potential makes a deal with him: He can forego his Shakespeare assignment if he’ll write about what really happened the night he and his friend lured a hard-of-hearing boy into a deserted alley. Julian feels this is an offer he can’t refuse, so he agrees. As he writes, readers get a ringside seat inside his mind. They see how he allows his best friend to talk him into killing a pigeon; how he and his friends set off homemade fireworks that singe off the eyebrows of a friend and sends him to the hospital; and how Julian is even talked into writing a love letter for another friend—which backfires when the girl thinks Julian wrote the letter for himself. At first Julian feels he’s received the better end of the bargain by avoiding Shakespeare, and he writes about everything he can think of—except the incident. But as he fills up notebook after notebook, he realizes he must eventually tackle the topic he has been trying to avoid since it happened: How he allowed himself to be talked into the worst thing of all—bullying another human being. 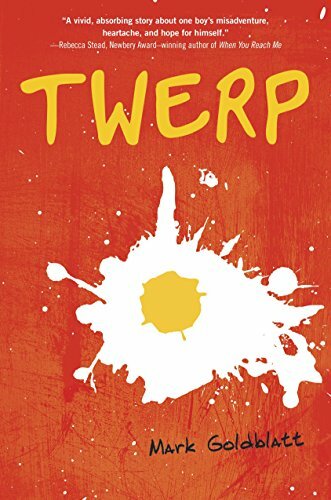 Twerp is a timely book that cleverly balances the typical concerns of upper elementary school children (e.g., being accepted, the mystery of little girls, who is the fastest boy runner in the school, etc.) with the tragedy of how following the crowd can mutate into bullying. Although this is not the most fast-paced MG in the world, it does move along at a pleasant enough speed to keep the reader interested. It should make great supplemental reading material for the elementary grades and can serve as a story-starter for myriad topics, including bullying, the importance of individualism vs. the need to belong, and the absolute necessity of thinking for oneself.